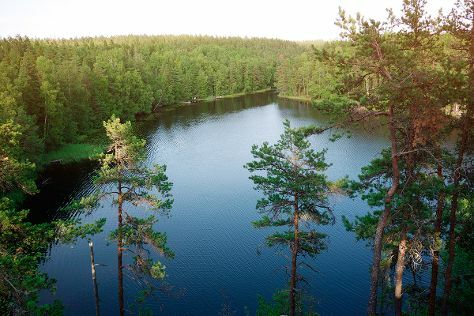 Take a break from the city and head to Teijo national park and Nuuksio National Park. Bring the kids along to Bellevue Beach and Linnanmaki Amusement Park. Venture out of the city with trips to Porvoo (Brunberg Candy Factory Shop & Porvoo Old Town), Arboretum Mustila (in Elimaki) and Tulliniemi Nature Path (in Hanko). Spend the 14th (Wed) exploring nature at Ekenas Archipelago National Park. Spend the 16th (Fri) exploring nature at Valkmusa National Park. The adventure continues: take a peaceful walk through Niivermaki Nature Conservation Area, kick back and relax at Beach Mansikkalahti, identify plant and animal life at Riverside Park, and test your problem-solving skills at popular escape rooms. To see ratings, other places to visit, and other tourist information, read our Helsinki travel route planning app . If you are flying in from United States, the closest major airport is Helsinki Vantaa Airport. August in Helsinki sees daily highs of 69°F and lows of 53°F at night. Wrap up your sightseeing on the 17th (Sat) early enough to travel back home.